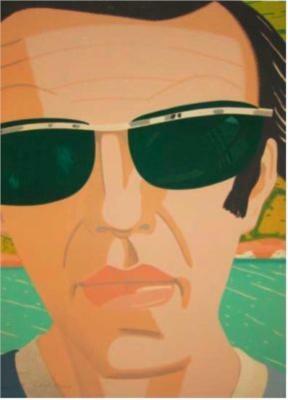 Alex Katz (born July 24, 1927) is an American figurative artist known for his paintings, sculptures, and prints. He is represented by numerous galleries internationally. Alex Katz was born to a Jewish family in Brooklyn, New York, as the son of an émigré who had lost a factory he owned in Russia to the Soviet revolution. In 1928 the family moved to St. Albans, Queens, where Katz grew up. Artworks of Alex Katz are removed from WikiArt due to a copyright infringement notice. A Tree In Winter, ? A Window In A Building, ? Ada in Black Dress, ? Ada in Black Sweater, ? Ada In Front Of Black Brook, ? Ada in the Water, ? Ada in White Dress, ? Ada With Bathing Cap, ? Alex Katz. Self-Portrait with Sunglasses, ? Bicycling in Central Park, ? Lili und Marleen: Roman, ? Tracy On The Raft At, ? Vincent Katz (with Frisbee), ? Vincent, Ruth and Paul, ? Your friends & neighbors, ?